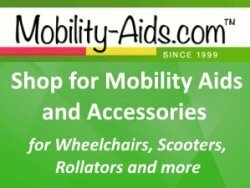 Modular wheelchair ramps may be a viable option to consider if you are looking for a convenient solution to providing wheelchair access to a home or business. 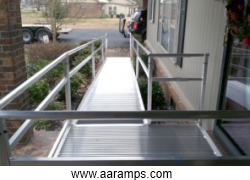 Modular ramp systems are lightweight, made from aluminum and offer tremendous flexibility. Designed to meet Americans with Disabilities Act (ADA) requirements, they can be expanded or contracted to specific space, height and distance requirements. Modular ramps can be straight or configured with 90-degree turns and even 180-degree switch backs to accommodate access needs and building design. In fact, modular ramps can quickly and easily bring a business or other facility into ADA compliance for wheelchair access. Built to be strong and durable, modular-type ramps can be used outside or inside for residential or commercial use. ADA standards suggest one foot of ramp for every one inch of vertical rise. They typically come in interchangeable sections of four, five, six, and eight feet. Thirty-six inch and forty-eight inch widths are available with and without handrails. Aluminum modular ramps are highly portable, relatively simply to install, and easily stored when not in use. 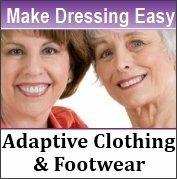 In addition, they can be easily moved to a new location and readily adapted to new configurations, including adding turns and switchbacks to accommodate access needs. In addition, some modular ramps are designed to incorporate architectural elements that complement the design motif of surrounding buildings.